It'll need some help on stage, but this is a classy thinline electro that makes a great at-home guitar. Tidy finishing. High quality build. Nicely playable neck. Alex Lifeson has been a PRS electric player for many years, though he's never been a signature artist until now, with this affordable version of his £8,600 Private Stock model. This not-called Angelus model is indeed based on the USA Angelus with a 394mm (15.5-inch) wide body that sits between Taylor's Grand Concert and Grand Auditorium sizes and Martin's 000/OM and dreadnought with a bit of mini-jumbo thrown in - every bit the model cutaway electro. "Fretting is very tidy and it's hard to fault the construction at all in terms of detail"
The Lifeson is, as its name implies, thinline. In hard benefit it equates to an approximately 14mm reduction in depth, which reduces the amount of soundbox air and also makes the guitar a little more comfortable, especially played seated. Internally, it uses spruce braces, back and top, the latter with hybrid X/classical fan bracing that's crucial to the original USA Angelus design. Then there are the wood specs. Whereas the previous SE models used solid Sitka spruce tops and either solid mahogany or rosewood backs with matching laminate sides, here the Lifeson retains the solid spruce top but with laminated dao back and sides - a fairly attractive light-brown striped wood - with contrasting tortoiseshell-like mottled binding. The soundhole decoration adds a little upmarket flavour, too, with an inlaid wood centre. The neck has a quite electric-like nut width, broad saddle spacing and depth that averages out at 22.6mm at the 1st fret and 24.6mm at the 10th, with a deep rounded 'C' profile and very subtly V'd sloping shoulder in the lower position. The neck is three-piece with the headstock spliced on and an additional heel piece, and it has a strengthening volute behind the nut. Fretting is very tidy and it's hard to fault the construction at all in terms of detail. The over-glossy finish, although clearly not over-thick, does hint at the guitar's origin and gives it a very 'import' feel. Acoustically, this guitar won't have you blubbing with emotion. Certainly, if you've had a strum on the USA models then this is much more run-of-the mill. If there is a similarity, shape aside, we have to say while hardly cannon-like (an often used term to describe the projection of the USA models), there's plenty of acoustic clout here, with its construction creates a bit of midrange push. 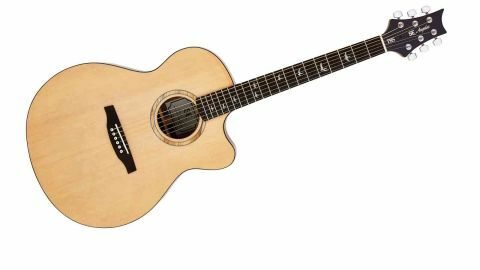 "It's smartly made, includes a hard case, and has slick playability with a clean, strong acoustic voice"
The guitar offers onboard controls, but it's of limited help in a stage environment. We audition it through a Fishman Platinum Pro outboard EQ going directly into Line 6's StageSource. With our EQ set flat and the volume and tone fully up (which, like most soundhole controls, means you turn them 'down', away from you), there's an ear-wearing amount of hard-edged highs, a very strong and hard midrange and limited lows. Backing off some of the tone control, even fully off, is a pretty good start but then you have to go outboard and pull out some of those hard mids - around 1kHz on the Fishman - and some thickness in the lower mids from the StageSource's sweepable midrange. There are no shortage of electros at these price points and although this will sell at lower street prices, it's a little hard to see exactly what PRS is bringing to an already crowded table. Regardless, it's smartly made, includes a hard case, and has slick playability with a clean, strong acoustic voice. The Lifeson's thinline body may be more comfortable for some, and this combined with its wood choice gives it subtly tighter lows and a bit more upper mid push - a nicely resonant character.